May Show – The Enchanted Poodle Club, Inc. The Enchanted Poodle Club, Inc.
Is the Poodle for You? Poodles In Rescue – and Successful Rescues! 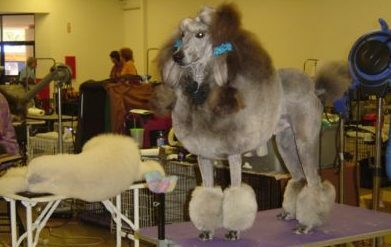 Every May The Enchanted Poodle Club organizes two shows as part of the New Mexico Combined Specialty Association, one in the morning and one in the afternoon. It’s a whole day of poodles of all sizes, and a wonderful opportunity for Poodle lovers to see all sizes and colors of our favorite breed! 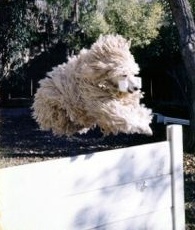 This year, The Enchanted Poodle Club’s specialty will be in Friday, May 10. Jack MacGillivray will judge conformation and Jill Warren judge Junior Showmanship for the first show, and Edd E. Bivin will judge Conformation and Julie Bremser judge Junior Showmanship for the second show. The event takes place at Expo New Mexico in the Manuel Lujan Building. There is no admission to get into the shows, but Expo New Mexico charges for parking. The premium is on Onofrio Dog Shows’ website here. However, if you aren’t familiar with shows you should know that there won’t be a final schedule until the entries close at the end of April. The New Mexico Combined Specialty Association includes the Rio Grande Valley Golden Retriever Club, the Labrador Retriever Club of Albuquerque, the Weimaraner Club of Albuquerque, and the Rottweiler Club of New Mexico along with The Enchanted Poodle Club. This show is part of the High Desert Cluster, which runs from May 9th through May 14th, and includes the Rio Grande Kennel Club and the Coronado Kennel Club. These two shows will have classes for poodles, too! 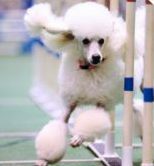 Between the three clubs, there will be 5 days of Poodle classes, usually all majors! The Cluster also includes obedience, rally, herding, and farm dog events. All of them involve poodles! Sandia Dog Obedience Club’s trial information is here, and The New Mexico Herding Dog Association will be sponsoring Herding Instinct Tests and Farm Dog Tests. Also, every year there is a national breed show, and this year there are two! Albuquerque is hosting the Silky Terrier Club of America and the Affinpinscher Club of America’s national specialties. We are selling Christmas Stockings at the show to raise money for rescue! Please click here for more information about these lovely Poodle Stockings! Poodles in Need of Foster/Permanent Homes! 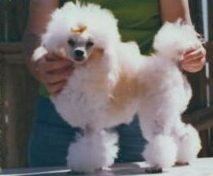 The Enchanted Poodle Club, Inc. is a 501(c)(3) tax exempt New Mexico non-profit corporation.